The entrance to the Christ Church Cathedral, an Anglican Church in Centre Ville, Montreal in Quebec, shows the beauty of its stunning architecture. In the heart of the commercial and shopping area of Montreal, Quebec in Centre Ville, stands the beauty of the Christ Church Cathedral, an Anglican Church which was built in 1859 and consecrated in 1867. The architecture on this Anglican Church is an imposing neo-Gothic building designed by a British architect named Frank Wills and Thomas S. Scott who carried out Wills design after his death. The design of the church had some engineering flaws and the stone tower and steeple started to lean with new foundations being poured in 1939 and 1940. Also in the 1990's, the stone work on the exterior of the church was restored along with the stained glass windows and in 2005, the interior needed repainting. 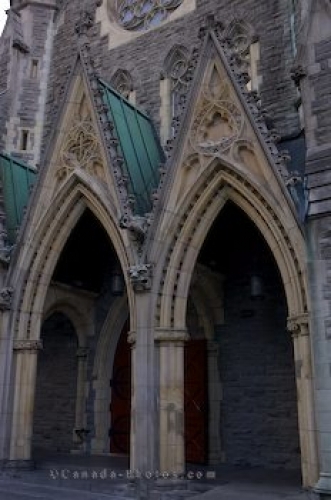 Picture of the Christ Church Cathedral entrance, an Anglican church in Centre Ville, Montreal. ... The steeple on the church stands at 127 feet height, the length of the nave being 112 feet and the total length of the building being 203 feet. The people belonging to the Anglican religion, still come to this church in Centre Ville, Montreal in Quebec for the sermons and special events. Cathedrale Christ Church, Christ Church Cathedral, Anglican Church in Centre Ville, Montreal, Quebec, Canada.